Election season is upon us. It’s the time when social media is blowing up with trash talk from the candidates and trash talk about the candidates. It’s the time when you’re tempted to “unfriend” some of your friends, because you’re sick of them posting political propaganda that is opposite from your own political beliefs. It’s the time when you see someone with a political bumper sticker for a candidate you dislike and you’re tempted to cut them off in traffic. It’s relatively easy to ignore opposing political opinions when they’re coming from the internet or co-workers, BUT it’s much harder to have a political divide when it’s your spouse! 1.Remember that what happens in YOUR house is more important than who goes to the White House. Strong marriages aren’t the ones where a husband and wife agree on everything; they’re the ones when a husband and wife’s commitment to each other is AWLAYS bigger than their disagreements. Every four or eight years, we’re going to have someone new in the White House, but your marriage has a lifelong term, so keep what matters most in perspective. 2. Have discussions, but keep the “debates” on TV and out of your marriage. Spend time talking about why each of you has the unique perspective and conviction that you have, but don’t make it your mission to argue your way into changing their mind. It’s not the best use of your energy. An argument rarely changes anyone’s mind; it just makes us more entrenched in what we already believed. You’re better off giving each other a foot rub and agreeing to disagree. If your spouse doesn’t share your opinion, it doesn’t mean he/she doesn’t respect you. 4. Have some fun with it. If you can’t have some fun in marriage, then where can you? If you want to secretly put your candidate’s bumper sticker on your spouse’s car and see how long it takes for them to notice, I personally think that’s pretty funny. Just be ready for him/her to do the same thing to you! For more ways to build a rock-solid marriage download our new “MarriageApp” from iTunes by clicking here (a Facebook login is required to access the app). You can also check out my bestselling new book “The 7 Laws of Love” by clicking here. 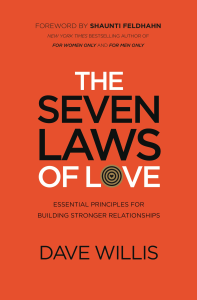 Dave Willis is the founder of StrongerMarriages.org and the author of the bestselling book, “The Seven Laws of Love: Essential Principles for Building Stronger Relationships.” For more information, please visit www.DaveWillis.org.